Keep this hand of mercy at its work one hundred million dollars : War fund week. Artist : P.G. Morgan. 1918. 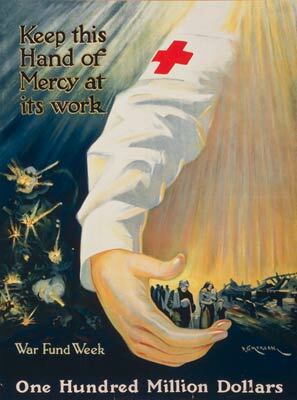 American Red Cross campaign poster promoting the war fund showing large arm coming down from the sky. Giclee reproduction canvas prints come on titanum primed genuine artist's canvas. They are waterproof and archival, reproducing excellent fine details and color. Overall canvas size is 16.54" by 11.69" (420mm by 297mm). We do not compromise on material costs - our canvas is imported from the USA, and prepared in London, England. Reproduction prints come on titanum primed genuine artist's canvas. They are waterproof and archival, reproducing excellent fine details and color. Overall canvas size is 16.54" by 11.69" (420mm by 297mm), and image size is slightly smaller to account for an approximate one inch border. Canvases come unframed and unmounted, and although they may be stretched, this is not at all necessary. These exquisite canvases are suited to traditional framing, and look great with or without glass, depending on personal preference. Copyright © 2019 The Photo Site.